Sorry if my blog hasn’t been as active this week, turns out it wasn’t a heavy cold instead it’s full blown flu, which I am pretty sure is spreading to my tonsils! Yay fun times! It’s that time of year I guess and with my immune system it is to be expected. My energy levels are low but I hate getting behind on my outfit posts #bloggerproblems. Anyway can we talk about these cowboy boots?! They were my mums, she’s had them for years and they were originally bought from the high street shop Office at the time. My mum has always loved cowboy boots and throughout her life has always had a pair or three! I expect it stems from her love for the old fashioned cowboy and indian films. Anyway last Christmas we all put some money towards a new more authentic pair of cowboy boots, which I will one day get around to sharing with you and I think thats why I managed to bag myself this pair from her. As much as I love the more original look and style, I must admit that I do love this red pair, as I believe they have an edge to them due their more unlikely colour. I’m sure the outfits you’ll see them in will be few and far between as styling them isn’t the easiest thing to do but that to me just makes them all the more special. What are your thoughts on cowboy boots? This look is amazing! 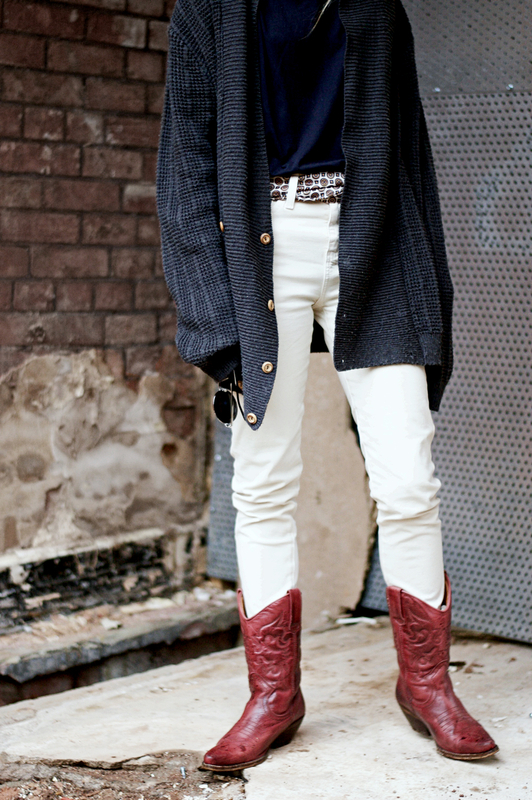 I never would’ve thought to pair cowboy boots with anything, but those red boots are the perfect statement piece(s)!